Brainwashed - Richard Skelton, "Front Variations (One & Two)"
It occurred to me the other day that Richard Skelton's artistic trajectory almost resembles the stuff of myth and folklore, as he was once akin to an enchanted bard who made achingly gorgeous and sensuously churning music full of life, heartache, passion, and darkly flickering light. Gradually, however, he became so disillusioned with mankind that he started playing for the moors, the hills, the earth, and the buried remnants of the distant past instead. Or, in his more ambitious moments, for the cosmos themselves. With the comparatively modest and exploratory Front Variations, however, Skelton is not straining for the stars nor focusing his elemental power to world-shaking intensity, but instead uses the disappearing ice sheets of Iceland as an unconventional muse for a pair of slow-motion feedback experiments. 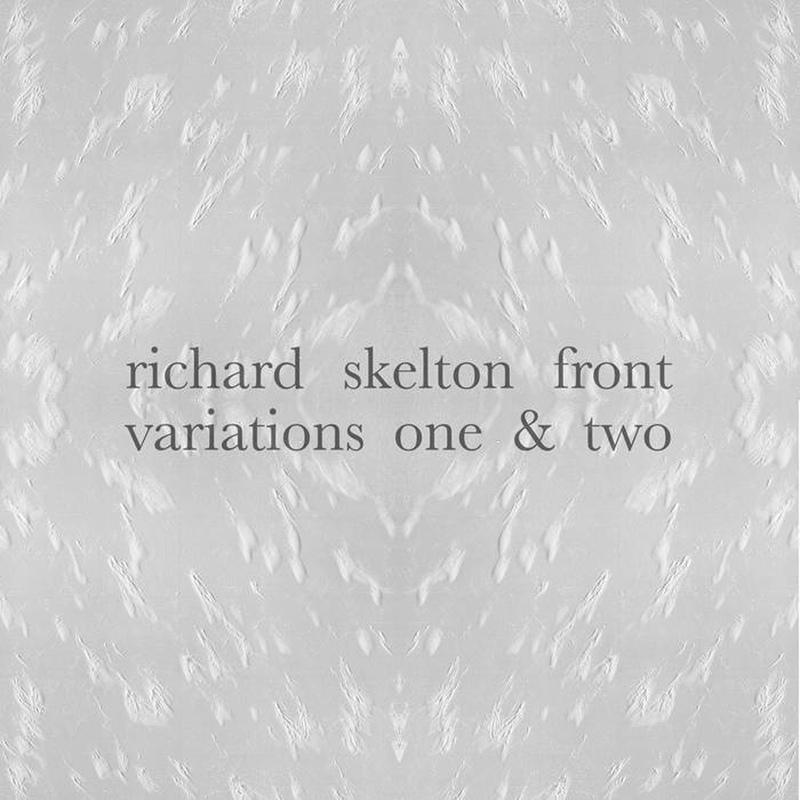 Appropriately, the two "Front Variations" were both birthed in Iceland, as Skelton lived in Seyðisfjörður during a residency back in 2016. The theme of the residency was "Frontiers in Retreat," which seems to be one that Skelton took quite literally and adhered to faithfully. Front Variations is specifically inspired by the ice-albedo feedback mechanism, which is kind of a natural death-spiral of sorts: ice sheets reflect solar radiation, so as their surface area decreases, the earth absorbs more solar radiation (less is being reflected). Absorbing more solar radiation naturally means higher temperatures, which means more melting ice…which means even less reflection of solar radiation…and then even higher temperatures, less ice, etc. With these two longform pieces, Skelton gamely tries to replicate this phenomenon through a simple palette of sine waves subjected to escalating erosion from feedback, distortion, and ring modulation. The resulting sound art is roughly akin to dark ambient, as the decaying waves manifest themselves primarily as a murky, subterranean-sounding hum further clouded by shifting and dissonant overtones and ugly harmonies. Unlike drone or dark ambient music, however, there is an organic unpredictability that pervades the brooding thrum, as the changing harmonies create oscillations and throbs that continually blossom and dissolve. Also, the textures and the frequencies are similarly fluid, as the deep, seismic hum periodically breaks into an eerie whines, hollow ringing, or scorched and corroded-sounding ruin. Given their identical foundation, the two versions of Front Variations share quite a lot of aesthetic territory, but there are some significant differences in their overall feel. The first variation feels like an ominous hum slowly rising from a wind-blasted and inhospitable arctic wasteland. At times, it coheres into a hollow pulse, yet any sense of structure or appealing melodic convergence seems to be entirely chance-based and ephemeral. The most striking moments tend to be those in which Skelton's mutated sine wave unexpected transforms into a deep, slow-motion howl that feels like it is emanating from the bowels of the earth. There are also some nice textural touches that surface as well, as the blurred thrum sometimes approximates an eerily bell-like timbre or swells into ragged, blown-out signal overload. The superior second variation takes things a bit further: rather than sounding like some ageless horror has started to awaken deep beneath the ice, it now feels like the ice itself has started to menacingly shake and warp. Again, however, the unpredictable interplay of the feedback and the sine wave dictate the arc, so there is no focused and linear escalation towards a full-on ice-quake. Rather, the deep and hollow thrum endlessly twists, plunges, waxes, wanes, roars, and subsides on its own glacial timescale. The howling crescendos just happen to be a bit more shuddering and visceral this time around. While the sine wave's transformations are certainly quite intriguing and heavy at times, the comparative absence of Skelton's compositional hand unavoidably makes Front Variations in somewhat minor release in his discography. It is more of a process-centric experiment than a truly satisfying aesthetic work, which I suppose was its intention: set up a system that mirrors the decay of a massive ice shelf and see what happens. The results of that experiment were certainly worth releasing, but I suspect they will be primarily of interest to serious fans of sound art who have a deep appreciation for the subtleties of colliding frequencies and their resultant oscillations. As for everyone else, Front Variations is memorable largely for (unintentionally) being the closest evocation of the Dyatlov Pass Incident infrasound theory that I have heard to date: this is the sound of an inhospitable frozen void that has unnervingly come to life with creeping subterranean menace.